The dedication to Jon was not just a pleasant thought or an obligatory gesture, anyone that was at last years race consciously or subconsciously carried some of the weight of what had happened for the entire year – as the race director, I know I certainly did and so did many of our volunteers. Over the course of the last year, sometimes it felt like we were holding our collective breath, knowing that before long we would be back to this place, on this day, to see if in fact everything could or would be OK. Jon’s college buddies who have made Superior an annual get together were with us again, although this time in larger numbers – they felt like they needed to be back in this place on this day too. Some of the first volunteers I interacted with on Friday for setup were Ben and Jeff, two of Jon’s closest friends – it is hard to articulate what that gesture meant to me, to the race and to our entire community. The day before the race a small group of Jon’s friends made a pilgrimage to the site where Jon spent his final moments and hung a simple and subtle memorial, nothing grandiose needed, as Jon’s memory and this beautiful place were he spent his final moments are larger than life all on their own. Race day arrived and it was to be a good day – a day of purging, closure and joy. Given some really tough race conditions at Minnesota races at the end of last season (the mud at Wild Duluth) and some impossible race conditions at the beginning of this season (the blizzard at Zumbro) it is safe to say that everyone was also holding their breath regarding trail conditions and weather for this years Superior Trail Race. A reality of the North Shore and the Superior Hiking Trail is that when the fire danger is high (meaning that it is very dry due to a lack of precipitation), the trail is correspondingly dry and in good shape, and this was certainly the case for this years race. Warm, windy and sunny weather the weeks prior had things pretty well dried up except in the lowest and muddiest spots and the trails were in stellar shape by Superior Hiking Trail standards – overnight we had some light showers and more of the same in the morning, but the rain was never heavy and had little effect on the trail. The temps were cool if you were running and cold if you were standing around – near perfect conditions for early season trail running and the performances and finish rates indicated as much. Well after all the front runners had come and gone and even after the youngest and oldest ever to finish had crossed, the clock struck 4PM, which is the official finish line cutoff for all distances – but those 25K and 50K runners that make the cutoff at Oberg are allowed to continue. All but one 50K runner had finished, who the sweeps had since caught and had happily taken on as their their personal project for the day. 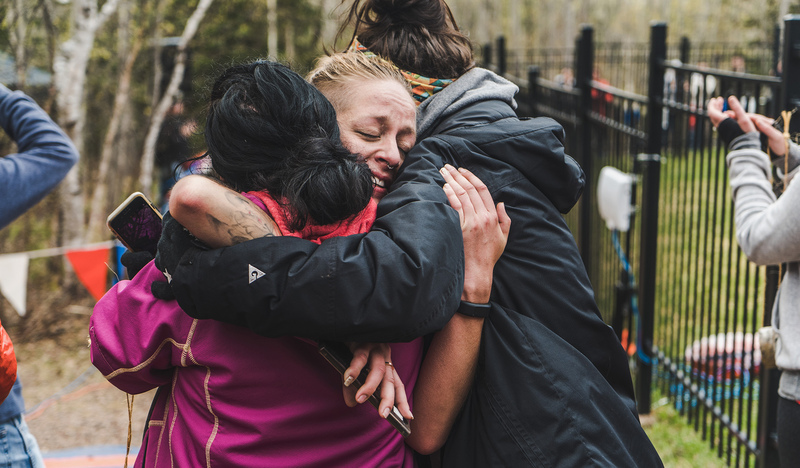 With a few opportunities to bail along the way, the runner, now with a team around her were determined to finish, their journey a roller coaster not only due to that last hilly section but due to the range of emotions that young lady experienced as she pushed on. After a completely overcast day, the clouds cleared and the sun shone in full force and shortly thereafter cheers could be heard from those that remained around the finish line, the requisite yelp of “sweeps are in!” could be heard and one last emotional runner would break down in tears on the finish line, first in the arms of strangers and then again when passed into the arms of loved ones. It was a day for purging, closure and joy and I think it is safe to say that we don’t have to hold our breath anymore.